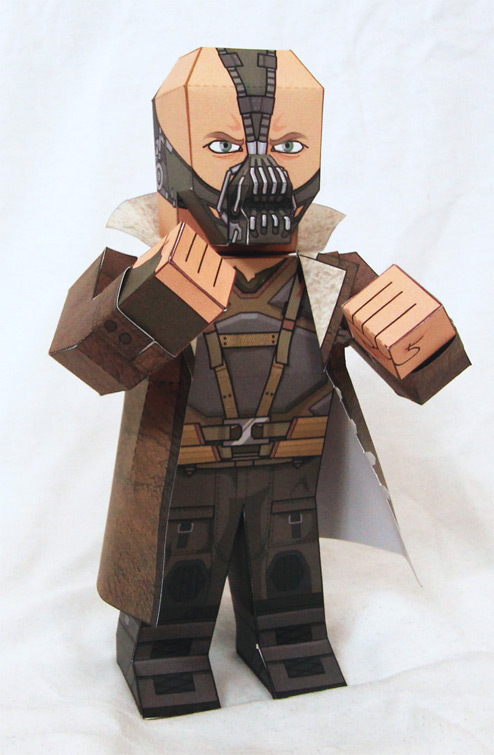 So, finally, I've got around to finishing Bane, and I'm pretty proud by the results. He looks a beast next to the other paper heroes. There are two separate version, one with a coat and one without so you can choose what look you want for him. 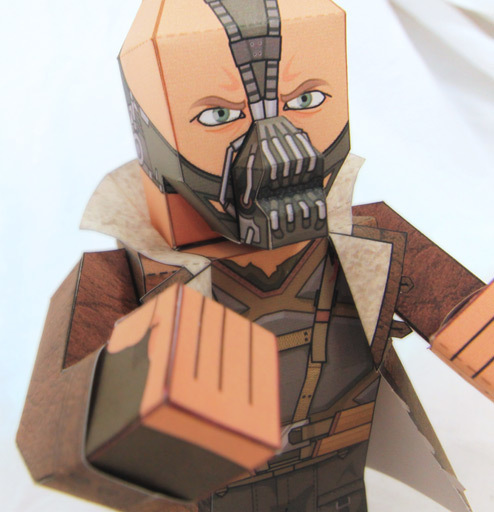 I was worried that he looked a bit TOO beefed up at first, but if any model should look like it could smash in all your other paper heroes, it should probably be Bane. The coat is the same as all the other coats so it shouldn't be a problem. The mask is very fiddly though, so I've included a flat 2D mask that you can stick on if you don't find it necessary to have a 3D mask, of if it seems too much like hard work. Sorry I've not really been able to keep up with my mail atm, but I will try and get back in touch with everyone ASAP. The Fire Fox bug is still there.. so if it causes an error when you click on it, right click the link and click "Save Link As..." instead. Everything you touch turns to gold. Another winner! Gosto muito desse site, gostaria de saber se seria possível que fizesse o magneto para mim? these are amazing!! any chance you will be doing spiderman? Amazing! I discovered the blog today. Please, do more DC characters, like harley quinn! Pleeeeeease, do a Harley Quin! And, of course, continue the amazing work you're doing. Hey dude .. would want to get in touch about some custom work to be done, whats the best way to reach oyu, no email address provided ? Please I want a Spider Man! Congrats for your site! Please do the WarMachine !!!!! I was wondering if are you going to create The Joker at any point? These things are pieces of art! Or a Superman or Spiderman!!! i love your work, so please do more heroes. Joker and a Bank Robber Joker variant. Superman or Joker would be interesting. Today we talked about you on our blog. We love your dolls! I hope you're still here. I would just like to say I'm from Australia and since my friend found this site I have been showing everyone I know. Hopefully some of them will donate. Thank you so much for doing this and I am so sorry about how busy you probably are. I can only imagine what it's like for you considering I barely have enough time to look at your site, that's how busy I am. You are really good at what you do and whatever is happening in your hectic life I just want to wish you good luck from us here in Australia. Hey, Why haven't you made any new my paper heroes? They are fun things to do. You should use the Storm base as a model for Raven from Teen Titans. Which, only reasons that you should have a Starfire too. I think we could use some Batgirl in here. I absolutely love what you do, and only wish I could figure out how you do your process so that I could help along the way. Great job with the papercrafts. Hi there, just wanted to let you know you have another fan! I love everything on the blog. I was wondering what you use to create your projects. I would love to see the process. I'm also hoping you haven't stopped creating, as they're all great! Educatia se poate pune in practica si intr-o maniera educationala. Se pot face jucarii cadou, ca metoda de stimulare a comportamentului pozitiv al copilului. Make more Marvel's Heroes PLEASE! Please, please, please do an agent venom!! !also, please. Your work is very good!! congratulations!! Please, make a papercraft of yuyu hakusho. JOKER, JOKER, JOKEEEER, PLEEEEEASE!!!!! You'ré the best!!! This is really a nice and informative post,. It's just lovely cartoon series,. Thank you for this really an amazing post about kids poems,. Wow,.it's just lovely blog about the kids poems,. It's just amazing and wonderful post about the kids poems,. Xavier your work is fantastic! I've been downloading MANY (more than 500) pepakuras all week, trying to categorize them between wich ones are the best, and your pepakura designs got the highest spot! But tell me, where the hell are you? Why no more models? Are you ok? I enjoyed by reading your blog post. Your blog gives us information that is very useful for us, I got good ideas from this amazing blog. I am always searching like this type blog post. I hope I will see again. You scarlett johansson vest can use this for any kind of academic writing work.